Barça’s Leo Messi received the Barça Players Association’s Fair Play Award on Monday morning for his play in the 2015/16 season. 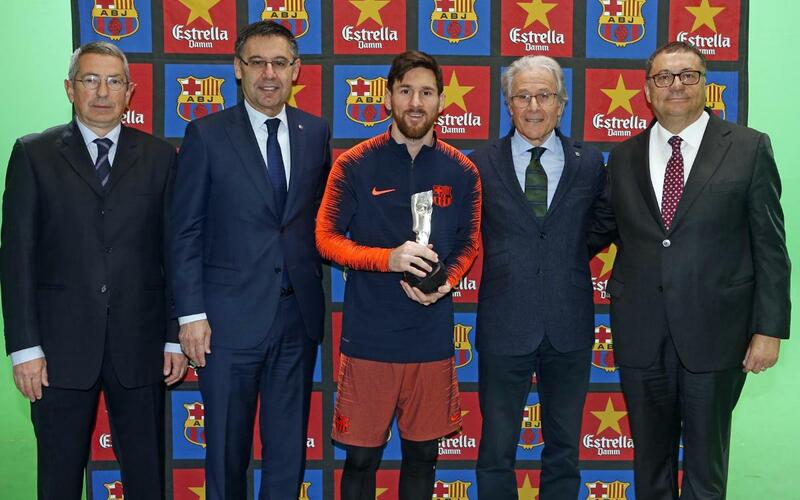 Messi was handed the award by Barça Players Association President Ramon Alfonseda at a ceremony attended by FC Barcelona President Josep Maria Bartomeu. Also in attendance were Pau Vilanova, the Club director who deals with the Association, and Ramon Agenjo, the CEO of Damm, the sponsor of the award. The award is annually given to the Barça First Team player who best exemplifies fair play, both on and off the field. At the end of the 2015/16 season, more than 3,300 people voted for the award on social media. Among the six finalists, Messi was chosen for the award by a 15-person jury. Messi, the five-time Ballon d’Or winner who is leading La Liga in scoring this season, is coming off his 300th game at Camp Nou, during which he has scored 309 goals to go along with 105 assists.